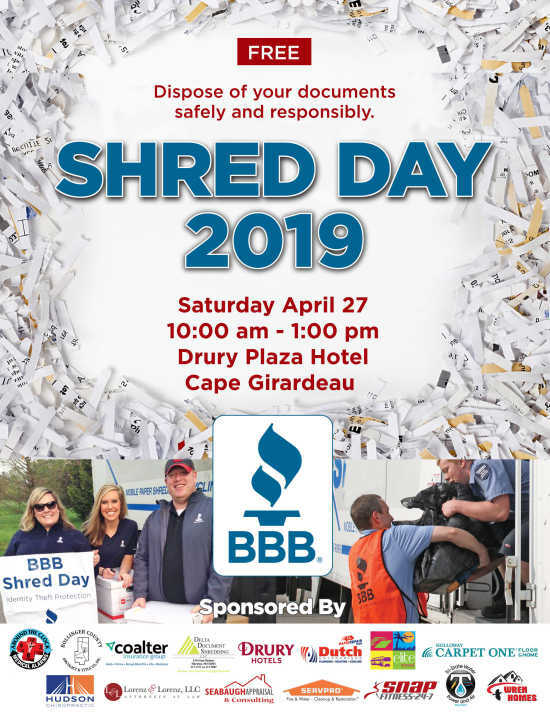 This year’s BBB Shred Day is Saturday, April 27, on the lower parking lot of the Drury Plaza Hotel, 3351 Percy Dr., Cape Girardeau. Consumers can shred documents from 10 a.m. to 1 p.m.; electronics will not be accepted. There is a limit of two boxes per vehicle. BBB asks that consumers use bags that can be shredded along with papers; consumers should be prepared to keep their boxes. Consumers will receive information on identity theft protection.